The project with a surface area of around 70 square meters is a guest pavilion that functions as an autonomous architecture conceived as an extension of a project that we had developed in the studio. The human scale of the pavilion makes it a comfortable space where to experience living in a garden. The pavilion consists of two rooms: one bedroom and a living room with a kitchen. There are also two bathrooms, one serving the pavilion and the other one as a support for the pool. Within the premises, the aim is that the built piece minimizes its impact on the garden from the main house. 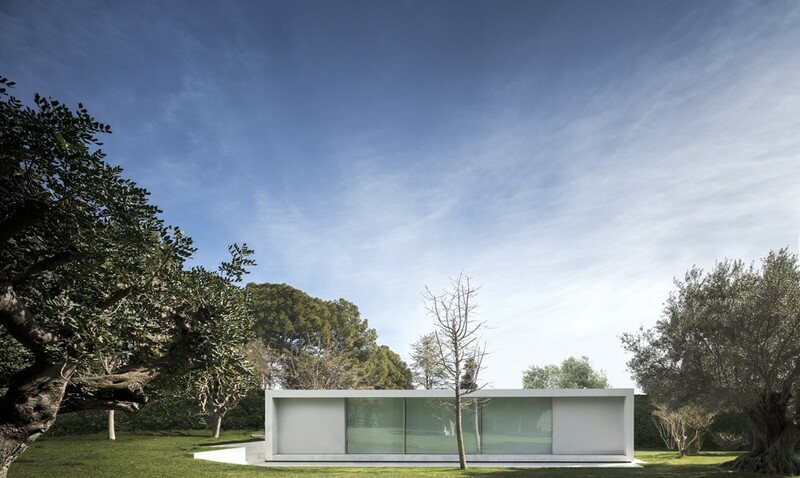 This way, the pavilion is located approaching one of the limits of the land, perpendicular to the swimming pool, showing its slimmer and opaque side towards the existing architectures. In the other direction the piece is a passageway, relating to the landscaped space and a sort of courtyard between the pavilion and the wall. A centenary olive tree, a liquambar and a pomegranate tree, together with the pool platform, serve as a link between the architecture and the garden. The deciduous liquidambar sieves the sunlight depending on the seasons. By means of the darkening system, it is possible to control the operation of the piece, more discreetly when it is opened to the courtyard, or completely open to enjoy the domesticated nature of a consolidated garden from the deposited pavilion.